Pumpkin is one of the only carbohydrates that are allowed in GAPS diet, so take advantage of this! Pumpkin may be prepared in very different ways: boiled, baked, fried; and it may be used in both savoury and sweet dishes. These tarts are made without any kind of flour. An apple is used for the tart base or crust, in which a filling that could be fruit puré or chocolate or whatever one wishes can be filled with; and on top there is fruit like strawberries, blueberries or raspberries. In the winter, warm food is more appetising. It is harder to bring oneself to eat fruit, which tends to be cold, and less appetising at this time of year. Although the ideal situation is to eat fruit in its natural form (baked fruit loses some nutrients), it is possible to bake different fruits in the oven to continue benefitting from fruits while staying warm on a cold winter day. Gazpacho is a very refreshing entrée dish that is traditionally eaten in the summer in Spain. Gazpacho is usually made of tomato, onion and cucumber, but in the last years watermelon gazpacho has begun to spread in Spanish restaurants. You can adapt the ingredients depending on the family preferences: the ratio between tomato and watermelon, avoiding onion if the children doesn’t like it, etc. Watermelon gives a sweet taste and together with the savoury test of the classical gazpacho creates this sweet and salty delicious taste. A funny idea to make fruit more attractive for kids is cutting them in funny shapes. For example, you can cut watermelons into hearts; a sweet message of how much you love them! When there’s a potato intolerance, one alternative to french fries are carrot and parsnips fries. Parsnips are not allowed in GAPS diet, so if you follow that diet only carrot fries will be possible. Here you will find a very easy recipe to enjoy something similar to french fries. 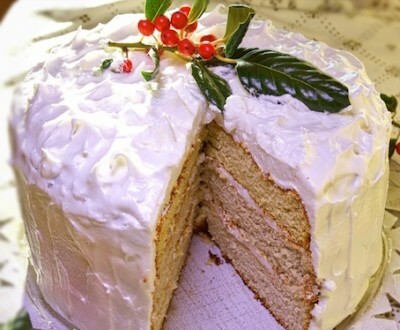 This American traditional dessert for Christmas has been modified in order to allow the maximum of people with some kind of food intolerances to enjoy it. In order to make it healthier, we have removed the sugar, the alcohol and we use gluten-free flour, although it’s possible to do it without any kind of flour or eggs. There’s a lot of different possibilities, depending on your food intolerances. The base of this pudding are fresh and dried fruit, so if you can tolerate fruits, at least from time to time, you will enjoy this wonderful dessert! We can do a lot of different recipes with bananas. We have already seen how to do an ice cream made of only bananas. Now you can learn how to do crepes (pancakes) and biscuits using only bananas. This is the ideal cake, the healthiest in the world and the best for people with intolerances, because the only ingredient is fruit! It’s a sweet cake but it doesn’t contain any sweetener: no sugars, no syrups, no honey and no dried fruit. Although we are in winter, an ice cream is always welcome, and you can take advantage of frozen fruit such as raspberries and strawberries; and banana for the base of the ice cream instead of dairy cream. It’s quite a labourious process so foresee at least 1 hour, and it needs to be frozen for at least 4 hours, so maybe it’s better to prepare it one day before it’s going to be served. This beautiful cake is very easy, although it takes some time. You will have to bake 3 basic sponge cakes and a big amount of frosting to fill between every layer and to cover the cake. It’s possible to use different ingredients, depending on the intolerances of every family, but there are some basic ingredients: flour (rice, coconut, almond, chestnut, …), eggs and some sweetener. Guacamole is a Mexican dip or sauce that use to garnish dishes like burritos, tacos, enchiladas, tortillas, etc. But you may use it to any kind of dish like salad, potatoes, pasta, toasts, meat, fish, or any dish you want. The basic ingredient is avocado, but it’s possible to add a large number of different ingredients: tomato, and lemon juice are the main ones, but also you can add onion, chile, pepper, oil, garlic, persil, olives, or any ingredient you like. It's a delicious dish, very easy to prepare and full of nutrients, thanks to the multiple virtues of avocado. This cake has a moist creamy texture like a pudding and it contains only pumpkin and dates as basic ingredients. It is possible to do lots of different recipes: with nuts, with different fruits, coconut, chocolate, carob, vanilla, cinnamon, etc. Salads are the best meal in summer: nourishing, fresh, easy and quick to prepare. There are infinite possibilities, here you will find some beautiful ideas of decorations that you can do with fruit and vegetables so these food become more appetizing and funny. The children of certain age will be able to do some of these shapes by themselves using some special tools, always supervised by an adult, and the youngest ones will be able to do the easier parts of the salad, and everybody will be enchanted with the pretty presentation. This is a recipe for making dairy free ice creams using only dates to sweeten. With this recipe you can make ice cream of different flavours: chocolate, strawberry, vanilla ... Simply we must choose the corresponding ingredient. It is also possible to make creams, for example, creamy chocolate like Nutella. Dates are a fantastic alternative to sweeten in a healthy way. Date paste is delicious as is, and it has a creamy texture that it’s perfect to make creams, ice-creams, truffles, cakes, etc. But it’s not the best option for making crunchy deserts, such as cookies or tarts. From date paste you can also make date syrup by simply adding water. In order to make the crust for pies I’ve used nuts as basic ingredient, simply by grinding them until get a batter like a marzipan. With this paste, you can make different shapes, like a pizza, a pie or small pies. These pies are not crunchy, because the paste is soft if it’s not baked, but it’s better to avoid baking if you want to stay in a raw food diet. But it tastes great. And then, children will enjoy making their own recipes adding the ingredients they prefer as toppings and fillings. This is a recipe to make raw vegetable crepes or pancakes without eggs. I have used a dehydrator machine to dry the batter. I have used some dates to make the batter stick together. The taste is lightly salted and sweet at the same time, it’s very tasty. You can make a lot of different recipes using different ingredients. The children will enjoy making their own crepes and parents will be very happy to see them eating vegetables! The traditional frosting is made of just icing sugar and water, and the topping for cupcakes use to be made of butter, cream cheese and icing sugar. In order to avoid so much concentrated sugar, other much more healthier options are presented here. For everybody on GAPS diet or any other kind of diet where rice is not allowed, this is an idea to make a dish that is visually very similar to rice. You can even make sushi with it. The procedure to make gelatin desserts and gelatin sweets is basically the same, it only change the mould where it’s fit. Children will enjoy this sweets and gelatins when there’s a special celebration or birthday parties, and avoid frustration for feeling different of the rest of children. Dates can be the main ingredient to make so many different sweets: truffles, chocolate or carob cream, marzipan, turron (spanish traditional Christmas sweet), etc. Dates are a very much healthier option to sweeten than sugar. Date puree tastes delicious as is, and you can mix it with carob or cacao powder, coconut, potato, sweet potato, cacao or coconut butter, nuts powder, banana, orange juice, etc., depending on your intolerances, in order to obtain different recipes. The chips made of vegetables and fruits are a good alternative for snack or to replace potato chips. You can use beetroot, carrot, sweet potato, squash, apple, orange, etc. In the past it was a way to preserve fruits and vegetables during the winter, and it was dried in the sun. Apple chips with cinnamon are a traditional food during Christmas time in some countries. Home-made chips have the advantage versus the ones in the shop that they can be made without oil, so they are healthier. But with oil they will be cruchier. And commercial fruit chips use to contain antioxydants (sulfur dioxide) and/or sugars. Some days ago I tasted dried pineapple for the first time, and with surprise I had a childhood memory of eating a pineapple chewy candy, my favourite one! Then I got the idea of doing a pineapple chewy candy with only dried pineapple. It’s very easy, quick and healthy! Halloween is approaching, give a healthy candy to your kids! In the hot of the summer, ice creams and sorbets are very much appreciated! This recipe of sorbet only needs water, fruit juice and honey. Furthermore, depending on the type of fruit, only fruit juice is necessary, such as melon or water-melon. It can be made from any kind of fruit, excepting those that are not too juicy, such as banana or avocado. There are many different ways to make GAPS friendly ice cream. I’ve chosen these 3 ones that differ on the base ingredient: fermented sour cream, coconut milk or banana. So you can choose the better for you depending on your food intolerances. And if you want to make other kind of ice cream, such as chocolate (attention, it’s not allowed in GAPS), lemon, vanilla, etc., just replace strawberries for the ingredient you like: cacao, lemon juice, vanilla extract, etc., and increase or decrease the amount of honey.